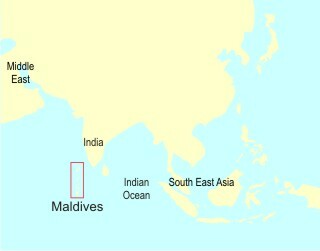 The The name "Maldives" means garland or necklace of islands. It is also known as the pearls of the Indian Ocean. Totaling over 1200 islands they group in ring like formations and look like necklaces or garlands from the air. Each of these "Robinson Crusoe" type coral islands most of them no more than a Kilometer wide, has the typical tropical Vegetation of swaying palms and a white powder like sandy beach on its periphery. The islands itself are encompassed by crystal clear lagoons that provides a breathtaking hues of colors as it deepens to dark blue ocean. The Maldives is as attractive underwater as it is over water, hosting two of the worlds top 10 dive spots, the Maldivian coral reefs are home to a wide range of colorful coral and probably the most diverse spectrum of fish one will ever see. Since the arrival of the first tourists, in 1972 the Maldives has come a long way , each year Maldives is host to over 600,000 tourists from all over the world. Almost a quarter of who are repeaters. The Maldivian Resort hotel concept is substantially different from the normal resort concept, as each Maldivian Resort Hotel is located on a separate island , it offers the ultimate privacy for those seeking a private moment . The Maldivian Resort Hotel range provides a choice foe everyone from the ultimate luxury spa oriented resorts to the more basic no frills resorts all with a touch of the warm Maldivian hospitality. Within our range of Maldivian Resort hotels your bound to find one that suits you , whether you are a honeymooner, a diver or would like a fun filled family holiday at resort providing entertainment for children, or alternatively would like to host a conference or mix a bit of both business & leisure. Should you require an island just for yourself or for a private part, even that could be arranged as we have resorts offering exclusive bookings. In addition to the obvious choice of diving , which is offered at all resorts with PADI qualified instructors, there are a number of other sports for the more adventurously inclined, banana boat riding, Jet ski , Para sailing to name a few.